Hi! If you found us through the Kindness story by our friend Sabrina Squire on NBC 12, welcome! 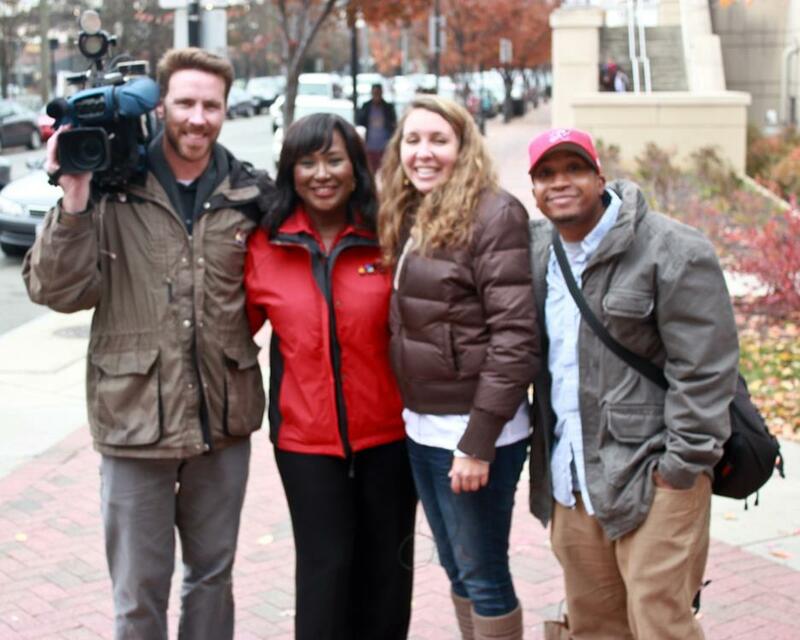 We teamed up with The Cheats Movement and NBC12 for a day of kindness tag. 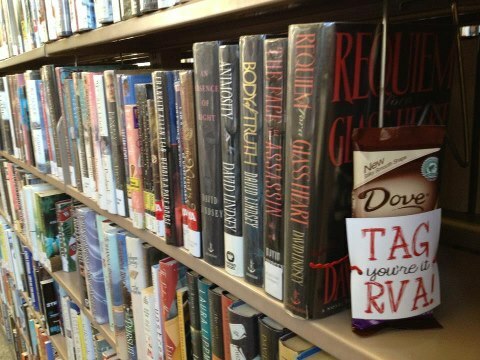 You can find out how Tag, You’re It RVA started here. We hope you will join us in the city-wide game of kindness! You can find the game cards at Garnett’s Cafe (thanks Kendra!) and at World of Mirth (thanks Thea! ), you can also download the cards and then print on your own! download- (front and back). Follow along with us and read the kindness unfolding in RVA on our Facebook page here. Happy Thanksgiving friends! We are so grateful for the good people of our kind city! It all started with a ShopRVA class (www.shopclassrva.com) …a group of 40 new friends came together to dream up an idea to crowd source kindness. What could this small army of wanna be city changers create that would make our town a kinder place to be? I pitched an idea and they ran with it. We decided play is always a great place to start. There is something about play that returns us to the best parts of ourselves. It reminds us of the simplicity and depth of joy, of how it feels to be free, of what we can do when the only motivator is fun. We figure if play and kindness get together, they might do a helluva bang up job. We want to invite you to join us in city-wide game of kindness in RVA! 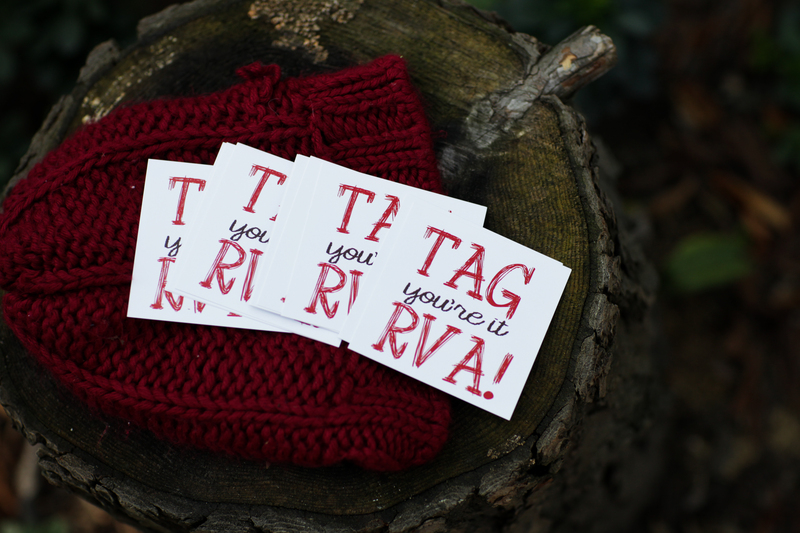 Once you get or find a Tag, You’re it RVA card, do one act of kindness and then tag/leave for the next person! Tag, you’re it, she’s it, we’re all it!!! 1. 40 people with 100 cards set out to play a giant city-wide game of kindness tag in RVA. 2. Each TAG card has a number and each player sets out to do one act of kindness and then “tag” the next person to go out to do the next. 3. These acts of kindness may be anonymous or not so anonymous, you may receive the act of kindness and the card or you may just find it. Either way, let’s play. Tell us about the kindness received or offered on our Facebook page, include the number so we can track the city kindness unfolding. 4. If you want a set of cards here is a download so you can print your own. download- (front and back) …and don’t forget to follow us on Facebook at www.facebook.com/tagyoureitrva ! Tag, You’re it RVA! Let’s go! The back story: so for the first time in my kindness work, this work in the world was not funded by me…it felt so good to know lots of people were part of moving kindness forward in our city. The Soulsister Fund, which is my sweet collaboration with the lovely Suzanne Vinson from Silver Tree Art saved the day when I was just so, so tapped. Those dear stickers, *sigh*, so many stickers that you sent forth are still giving…so thank you. We are so grateful. AND so much thanks to Liz from Signs By Tomorrow for helping us print the cards at a super kind deal!